Look up at the sky, and there’s a chance you’ll be able to spot Ursa Major, Andromeda, or even Cassiopeia—certainly the Big Dipper. However, you may have a harder time identifying the Aquila constellation. That’s because, as dual English and history major Lauren Koenig ’20 explains, most of our knowledge of the constellations comes from Greek mythology. “Rarely is there any popular literature on the constellation mythologies of Mesopotamia, China, or the ancient Americas,” she says. Koenig’s final product, named Fledged, explores the mythology of the Aquila constellation through five cultures: the Wergaia tribe of Australia (3,000 BCE), Greece (2,500 BCE), China’s Han dynasty (200 BCE), the Chumash tribe near Los Angeles (1450 ACE), and the Incan empire of Peru (1550 AD). 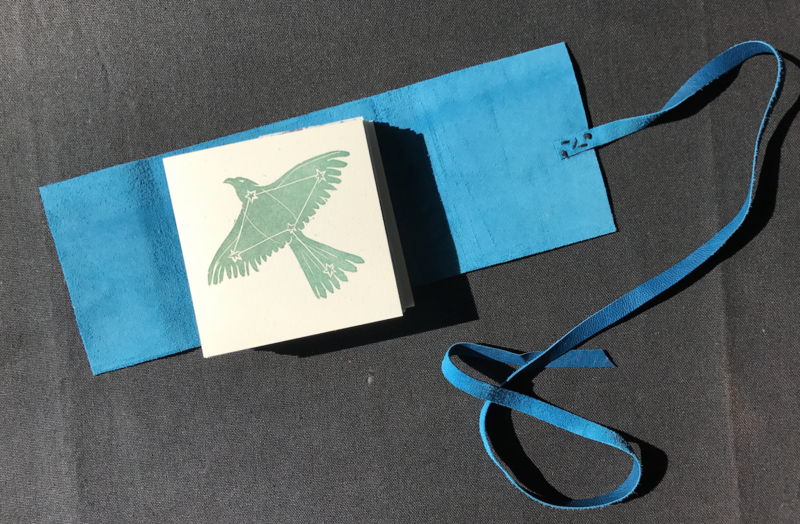 The limited edition run of only 15 copies is a four-inch square book, with a leather cover, printed on Rives Bfk (a French, cotton paper) and Chinese Heather papers using linocuts, with type set in a handset letterpress. “I chose stories that were either personally moving or just plain fun: the Chinese lore of a bridge between forbidden lovers, or the Sky Eagle of the Chumash who determined the harvest based on his luck at gambling that season,” reflects Koenig. So evident, in fact, that the National Museum for Women in the Arts acquired a copy of Fledged for their artist book collection. “The fact that my work warranted acquisition by a museum is surreal. Whether or not it is ever displayed, used as a teaching material, or collects dust on a shelf, it’s validating to have someone say place value on the work you create,” says Koenig, whose book was also shown at the Art Libraries Society of North America’s book fair, one of the few book arts-focused fairs in the country. Last fall’s Typography and Book Arts class departed from the traditional final project of a collaborative class book. “It was the first time in approximately 30 years that students designed and created individual artists’ books,” explains Blassingame, who took students to the Rare Book Room in Scripps’ Denison Library to study past artist’s books made by students at the Scripps Press for inspiration. “Lauren challenged herself in experimenting with techniques, materials, and forms, and Fledged overall is an excellent piece in terms of craft and concept. It is interactive, surprising, and entertaining but simultaneously enlightening—I am thrilled for her,” Blassingame said. The Scripps College Press was founded in as an experimental typographic laboratory and was funded through the efforts of the class of 1941. A new typeface was commissioned from renowned type designer Frederic W. Goudy for the Press’ exclusive use; the type was the class gift of the students of ’41. In 1986 Kitty Maryatt became the director of the Press and instituted a new program of collaborative class books. She retired in the 2015-2016 academic year with 60 student-produced books under her belt. Blasingame took over directorship of the press in the summer of 2016. “I want to honor the rich history of the Press while looking towards the future,” Blassingame says. For Koenig, the future isn’t yet certain, but she’s thinking of working in the publishing industry doing editorial work or writing or curating for a museum. Regardless, Koenig’s success seems written in the stars. Scripps College Move-In Day: Meet our newest residents!